However, many American and Canadian businesses are turning to the Philippines to find virtual assistants – but are the Philippines the right place to look? Filipino virtual assistants are affordable and accessible, but there are also affordable options closer to home. Assistants in the Philippines may have a low understanding of North American business culture, which can cause frustration between you and your company and your virtual assistant. In addition, Filipino virtual assistants can come with language and cultural barriers. Are you paying the right price for the quality you’re receiving? Virtual assistants from Latin America are available at similarly affordable prices as virtual assistants from the Philippines. 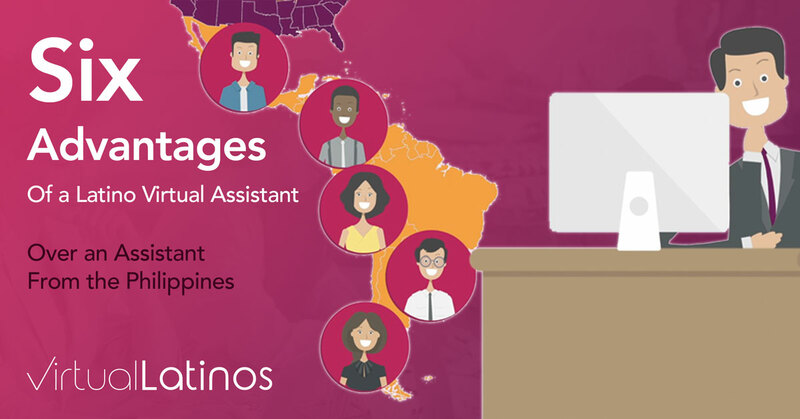 In addition, Latino virtual assistants provide numerous benefits due to their proximity to the United States and Canada that Filipino virtual assistants lack. Latino virtual assistants have advantages in language, culture, work strategy, time zone, and authentic American experiences. For the best value for your investment, choose a Latino virtual assistant! When you hire a virtual assistant to work for you, you expect him or her to have a strong grasp of your expectations. You want to operate in certain methods and meet deadlines in a prompt and efficient manner. In addition, you expect a certain quality of work in a certain amount of time – however, some cultural differences can lead to a decline in quality. The Philippines are not as similar in culture to the United States and Canada as countries in Latin America are. The United States and Canada impact the day-to-day culture of these countries due to proximity and a heavy colonial influence. In the Philippines, these influences are not nearly as strong due to how far away the country is from North America. As a result, your company will lose certain aspects of North American business culture in translation with Filipino virtual assistants. When you hire a Latino virtual assistant, you do not have to worry as much about cultural differences impacting your work quality. Latino virtual assistants know the ins and outs of North American business culture because they, too, live in the Americas and have witnessed this culture throughout their lives. When you hire a virtual assistant from the Philippines, you are hiring someone who is working on a completely different schedule from your own. For example, if you work in California and you need to call your Filipino virtual assistant around 2 pm during your workday, you will reach them at 6 am Philippines time. This means that Filipino virtual assistants often start work at 1 in the morning. Not only can this cause scheduling confusions and inaccessibility, but your Filipino virtual assistant may also be fighting severe sleep deprivation which could impact the quality of your work. Latino virtual assistants work on your time zone and do not experience such drastic time differences. They will have a good sleep, be happy to work, and be promptly responsive. For example, a worker in Mexico City will return your 2 pm call at 4 pm their time, starting work at 11 am. Many Filipino virtual workers have little experience in the United States or Canada. They may have never visited your country and have no idea what it is like to live there. This inexperience can be a crutch in producing quality work that requires knowledge of your country. However, many Latino virtual assistants have experience visiting, living, or even working in America due to proximity. They have a stronger grasp of American culture than Filipino virtual assistants. Filipino virtual assistants may not have a strong grasp of English due to the differences between Filipino and English grammar and phonetics. Latino virtual assistants are often fluent in English and Spanish, which increases their communication skills. In addition, fluency in Spanish is a much more valuable skill than fluency in Filipino in the United States and Canada due to the high number of Spanish-speaking clients your business serve. Many people opt for Filipino virtual assistants due to their affordability. However, Latino virtual assistants are available at similarly affordable prices. With a Latino virtual assistant, not only do you enjoy low cost, but you also see a higher caliber of work due to cultural and linguistic advantages. Latino virtual assistants provide significant advantages over Filipino virtual assistants at competitive prices. For the best return on your virtual assistant investment, contact Virtual Latinos today to find the best employee for your company.